Adam Creighton: I’m Adam Creighton, a co-owner of Panic Button, and the Studio GM and Director of Development. Basically, I’m responsible for running all Panic Button’s projects, staff, and business. Miketendo64: To be frank, DOOM isn’t normally the kind of game you would expect to be able to play on a Nintendo platform. In fact, quite a few games that are out on Switch already and games that are in development for it are not games you would normally expect on a Nintendo platform. What was your reaction to first hearing Nintendo wanted DOOM on Switch and given Nintendo’s change of stance with regards to mature content on their platforms, what do you think this means for the future of Nintendo Switch? Adam Creighton: Ha! There are so many games like this I want to bring to Nintendo gamers! I’m sure Nintendo has wanted DOOM on Nintendo hardware for a while, I know id Software has wanted DOOM on Nintendo hardware, and we at Panic Button have definitely wanted to bring DOOM to Nintendo hardware for a long time. As far as the future of the platform, I think Nintendo is going to continue their support of titles that make sense for the hardware. And I think they’ll continue to surprise people. 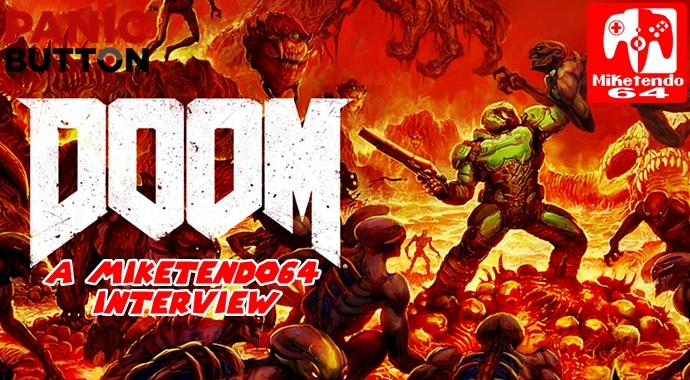 Miketendo64: Even now, to the surprise of many, DOOM is coming to the Nintendo Switch, how did it feel to finally share the news with the world? How long has the port been in development and how does the “finished product” compare to what you had planned to do when development begun? Adam Creighton: It feels great! I’m a fan of the franchise and this latest incarnation, a long-time fan of Nintendo and their hardware, and really wanted to make this happen. We’ve landed where we thought we would for moving an awesome beast of a game onto a piece of hardware it wasn’t planned for – Because the hardware didn’t exist when the game was made. Miketendo64: One negative players might have with DOOM is the fact that multiplayer has to be downloaded. We understand the reasons why this is, but in your opinion, just how important is the download? We’re aware multiplayer isn’t an extra cost, but if players opted to not download it, other than missing out on online play, for the sake of clarification, how exactly would this affect DOOM on the whole? Adam Creighton: To get the best experience, you’ll definitely want the game update, even if you’re not planning to try multiplayer. Also, you should really try multiplayer. Since the multiplayer is available digitally, we took advantage of the (slightly) extra time to add extra performance enhancements to the game, to keep that consistent frame rate wherever it’s feasible. Bethesda included additional non-English voice over content. I highly recommend players download the update for the best possible DOOM experience on Switch. Miketendo64: With a solid 720p and 30fps resolution, DOOM promises a stunning experience when docked. Was it always the intention to scale DOOM down or something that just happened along the way? Adam Creighton: To bring DOOM to Switch, we wanted great visuals at a solid frame rate, and that makes the experience consistent and fluid. People have played pre-release versions of the game and the feedback is it’s in that group of great looking and great playing games on Nintendo Switch. This console is a neat piece of hardware, and I think people who understand what the hardware is capable of are going to be surprised and impressed by what we’ve delivered with DOOM. We’re doing clever things with the hardware, using dynamic resolution depending on the scene, and other techniques to retain that classic DOOM feel. We’re working to balance a lot of things – making sure the game is fun on televisions and in handheld mode, has good battery life, and visuals are great and resolution isn’t jarring. We’re up to 720p when docked, and a lower resolution when in handheld mode, as we balance those things using these techniques to keep the game consistent and fluid. Miketendo64: Other than the graphics, another notable change is the lack of SnapMaps. Any chance you can share the particular reason as to why it was cut from the Switch version? Adam Creighton: I feel like id Software, Bethesda, and Nintendo made some great decisions bringing DOOM to gamers for the holidays. Obviously I don’t speak for them, but I think they brought the features of the game that make sense to the platform. Miketendo64: With this being the era of DLC and extra content, although the Switch version is being pre-packaged with pretty much everything that was created for DOOM, do you know if there are any plans for any additional content post-release? Adam Creighton: It’s pretty great Nintendo gamers are going to get single player, multiplayer, and all of the DLC on Day 1. Bethesda and Nintendo are both super responsive companies, and they tend to listen to what gamers want, look at the success of a game, and they’ll probably make any follow-on decisions based on that. Miketendo64: With Bethesda working on the Switch release of Skyrim and including Zelda amiibo support with it, was amiibo support ever considered for DOOM? One example being able to use Metroid amiibo to be allowed to turn enemies into Metroid or even use some of Samus Aran’s weaponry? I’ve found Nintendo and Bethesda to be forward thinking, excited about their brands, and looking for good integrations across their products. I’m sure they evaluate all of these opportunities pretty carefully. Miketendo64: Interestingly enough, DOOM isn’t the only big game you’re currently working on as you’re also handling the port of Rocket League for Nintendo Switch. How has it been working on two very different games with a similar release window? And which game came along first. Adam Creighton: I think if you ask people at Nintendo, Bethesda, Psyonix, and Panic Button who had the idea to bring games to the hardware, you’d get a lot of different answers, and the reality is it takes a lot of different people to make that happen. I can say I’ve wanted both these titles on Nintendo Switch for a long time, and worked concretely from my side to make that happen. What came first doesn’t really matter – Games are made based on the intersection of availability and timing and business drivers, and at the end of the day, Nintendo gamers get a great holiday season. Miketendo64: Because the Nintendo Switch is getting the likes of L.A. Noir, Skyrim, Ubisoft’s Steep, DOOM and so many others, there’s starting to be more and more demand for a Mass Effect: Andromeda port. Given what you were able to pull off with DOOM, if EA or BioWare were to approach you with regards to porting it, is it something you’d be up for or turn down? Adam Creighton: I feel like we should pause to enjoy the awesome of that list of titles coming to the platform. When you look at Panic Button’s portfolio, you’ll see a definitive story over the last six years, as we increasingly add high-visibility, high-caliber titles. We recently moved into digital publishing, where we create opportunities for platform-special versions of games. We’re having a lot of different conversations about a lot of great potential projects, and we’re evaluating those conversations seriously. Also, I do like Mass Effect. Adam Creighton: This is a dicey question, because I don’t want people thinking because I name a title we’re attached to it. As far as making a game better? I don’t know that I could make a great game better, and even if I could, it would be in a small way, and it would be because I’d be editing – Building on top of the hard work that was done by the team that made the game great. I’m a lifetime gamer, and consider pretty much everything I do at work a gift. Adam Creighton: Thanks so much for taking the time to talk with us! To our fans – Thank you for being fans! Our team makes games because we love games, and we want to work on things we want to play as gamers. I hope that comes through for you. Now since this interview is being posted way after the release of DOOM and Rocket League, instead of wishing Adam and the Panic Button Games team the best of luck with them, as we already know both ports have been a huge hit, we just want to say thank you for everything you did. We loved both games, scored both a 9 in the reviews we put out for them and we eagerly await what you bring to the Nintendo Switch next! And Happy Holidays, you guys deserve a long rest!